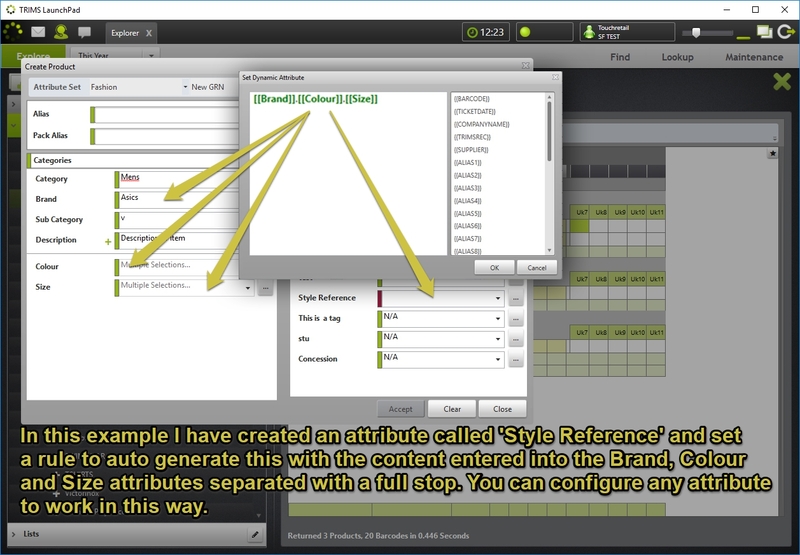 TRIMS allows you to create your own set of attributes that you can use to hold product data specific to what you sell. Quite often you will have a need for entering repeat data into different attribute fields. If you are integrating with an ecommerce store you will probably need to create, and map, an attribute called ‘web description’ to the website. You may want this to be a combination of other individual attributes that you have. Your brand, description, colour and size attributes for example. Rather than type the data into each individual attribute and then re-enter the same data again into the ‘web description’, you can setup a rule that automatically populates this attribute based on the content of the other attributes. This is an advanced feature and may appear complex, however not everyone will require this facility, but for those who do need it, the reward is huge. It is a great time saver, and also minimises data entry errors. Our support team will assist in setting this up where required. The same applies to product stock codes and SKUs. A SKU (or a product Alias in TRIMS terms) can be generated based around a combination of attributes. creating a product with 3 colours and 7 sizes, this would create 3 individual products, 1 for each colour, all containing the same 7 size variants. Without this rule, just one product would be created containing 3 colour variants and 7 size variants. Not every retailer will need this facility, but those with more complex setups, who find themselves repeating work, can use this powerful TRIMS facility to save huge amounts of time and minimise on data entry errors. Set rules that auto generate product attributes from combinations of other data that you enter when creating products.